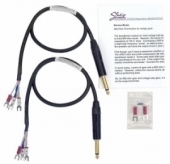 For connecting vintage and reissue pro audio gear using screw type barrier strips, here is a set of high quality adapter cables, built with Quad Star cable. These cables are perfect for making connections to standard XLR from UREI and Universal Audio LA2A’S, LA3A’S, and 1176’s, Pultec EQP Tube Equalizers and other 60’s, 70’s, and 80’s tube and solid state with screw terminals. The lugs are marked + and - to help you avoid phase reversals. A termination assembly with a metal film resistor is included for proper matching older 600 ohm gear. We also include a handy guide with guidelines for termination of vintage 600 ohm gear. **** Cable: Mogami 2534 Neglex Quad. **** Connectors: Neutrik gold plated XLR. **** Lugs: #6 insulated fork lugs, with terminations crimped and soldered. **** Length: 12 inches (1.8 meters) end to end. **** Termination resistor: 604 ohms, metal film, 1/2 watt, 1% tolerance. 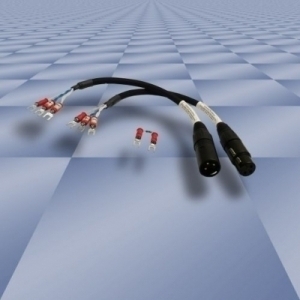 This quality interconnect is American made using the best components. It’s rugged and is built to last. Twenty years from now there’s a good chances your valuable vintage unit will still be in use, with our adaptor and resistor still connected to it! A note about the termination resistor. Transformer outputs on vintage tube gear (and some early solid state) are usually designed to drive 600 ohm inputs. However, the inputs on modern audio gear are bridging, with an impedance of 10k or more. Connecting a 600 ohm transformer output to a 10k inputs tends to cause “ringing”, with a slight high frequency “bump”. The termination resistor will correct this problem and allow the output circuit in your gear operate the way it was designed to. Overseas buyers will be happy to know that no customs paperwork is required for this item, because it is under the USPS 16 ounce weight guideline. Thanks for looking and please email us with any questions.